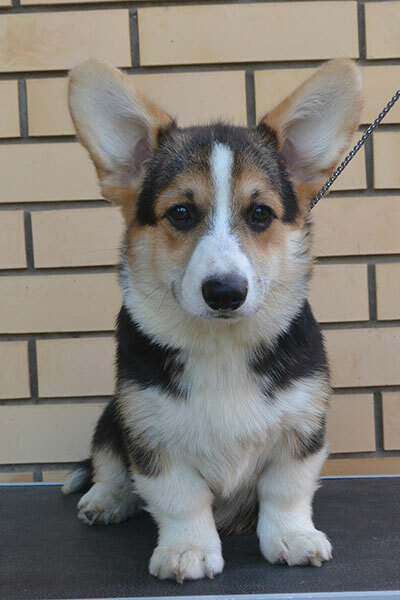 Welsh corgi pembroke Kennel ALFAWISH, Moscow, Russia. 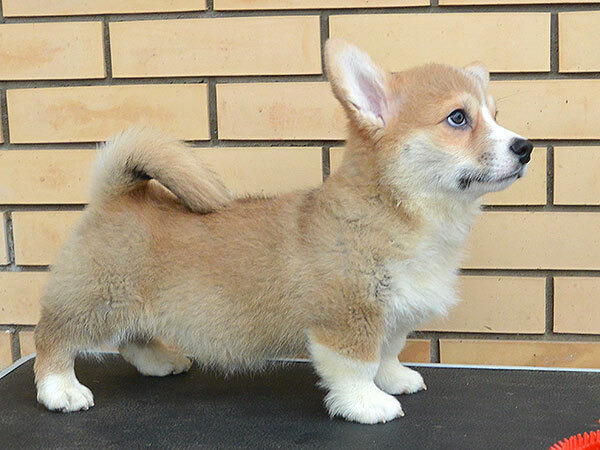 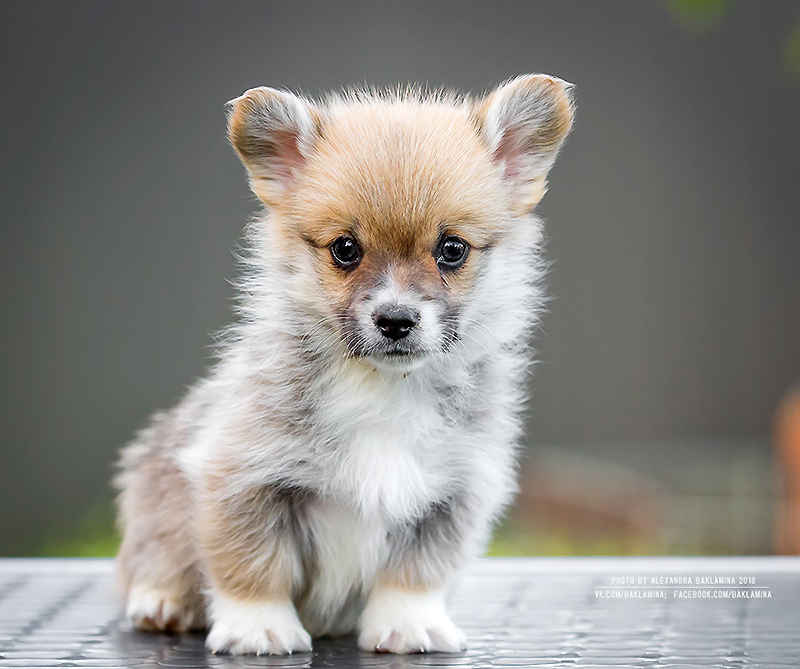 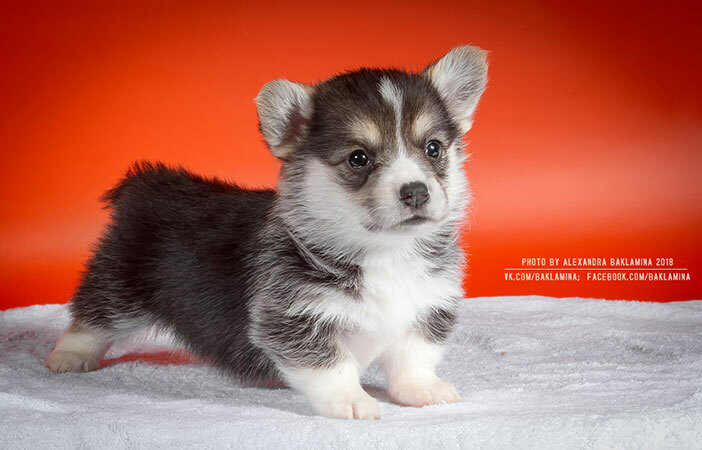 of welsh corgi pembroke Kennel Alfawish! 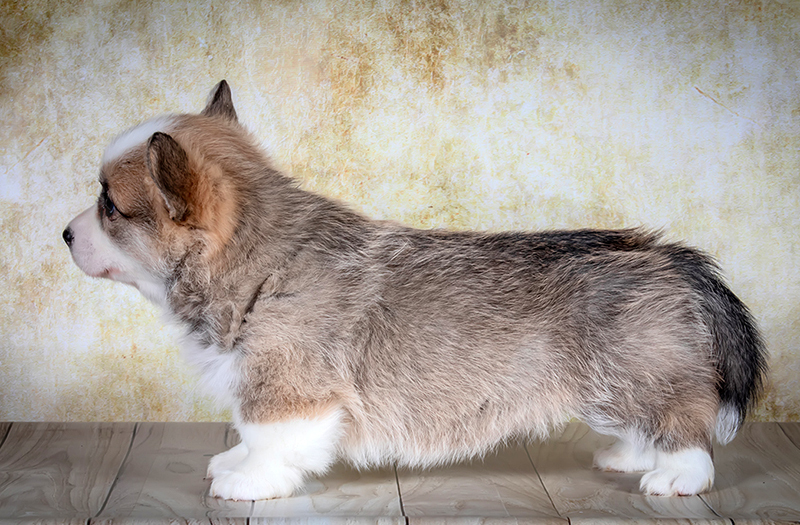 Our kennel deals with the only one beloved breed — welsh corgi pembroke. 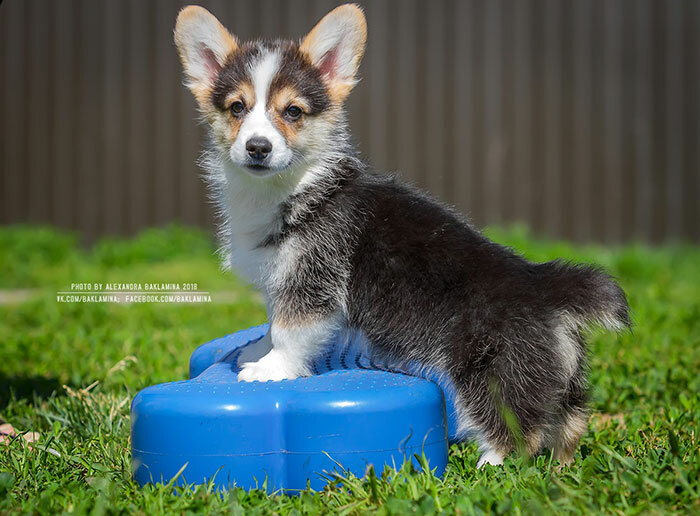 We are glad that you share with us interest to this little dog with charismatic appearance and aristocratic manners followed by the strong character, intelligence and outstanding ability for training common to the sheepdogs. 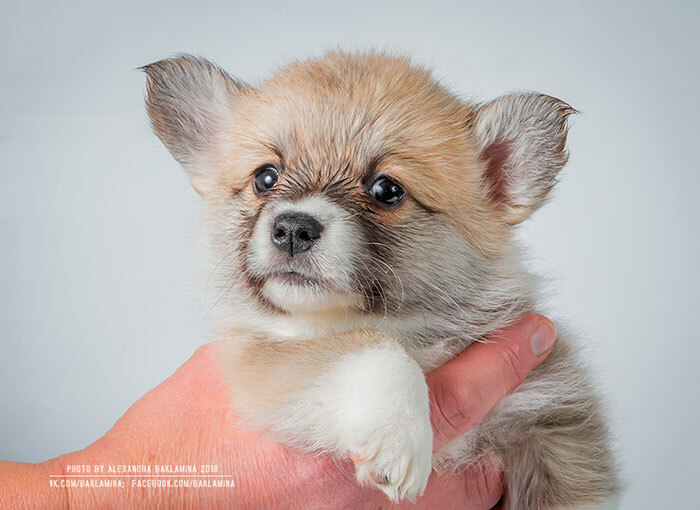 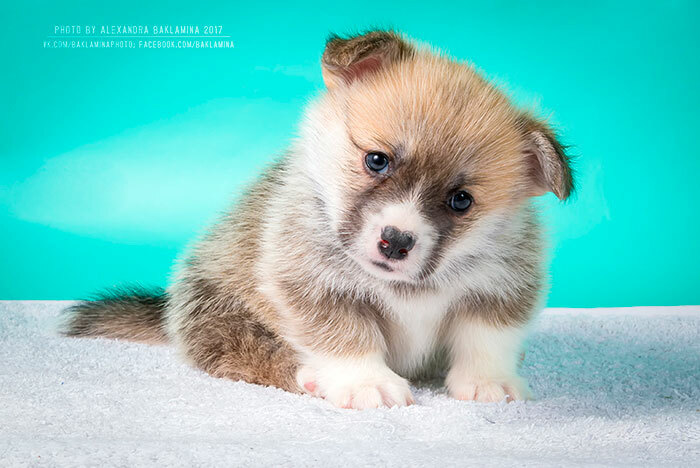 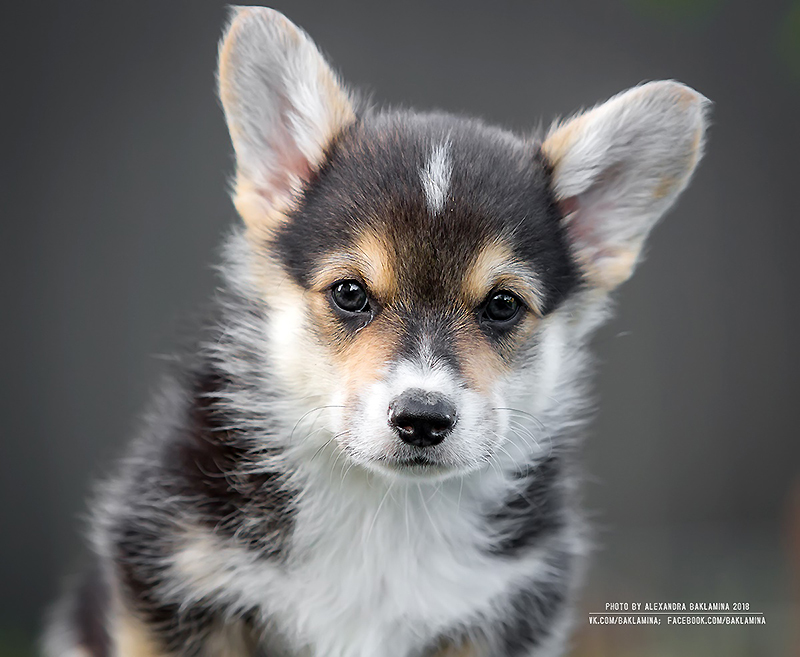 Our «corgi love story» takes its beginning from the first moment we saw this little charming creature at dog show. 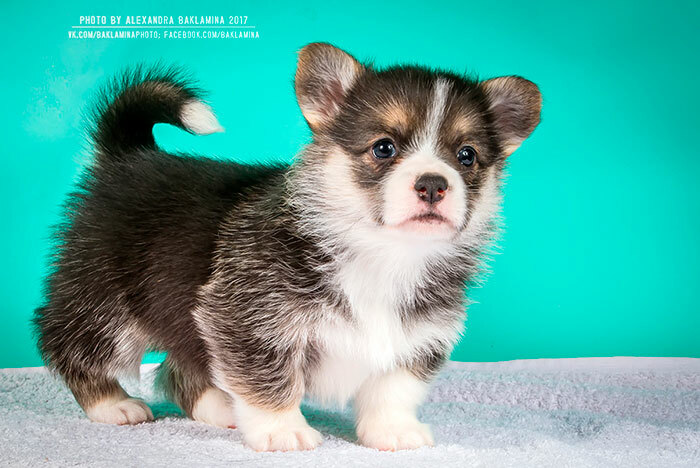 Soon after that we purchased our first corgi Andvol Felichita. 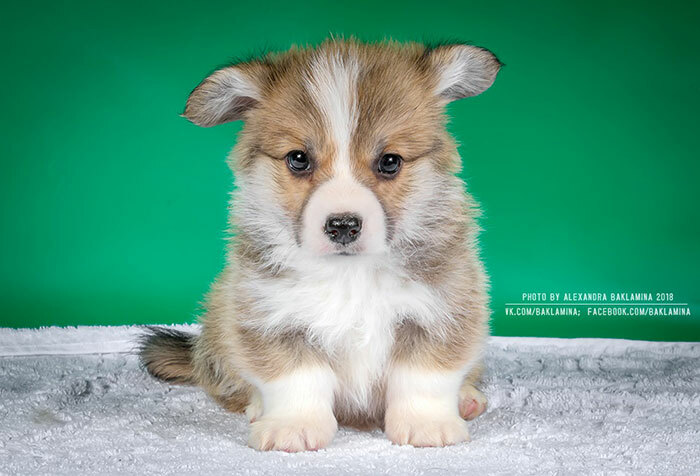 Now our «corgi family» has enlarged with her puppies and puppies of her puppies… And our affection to this breed becomes stronger every single day. 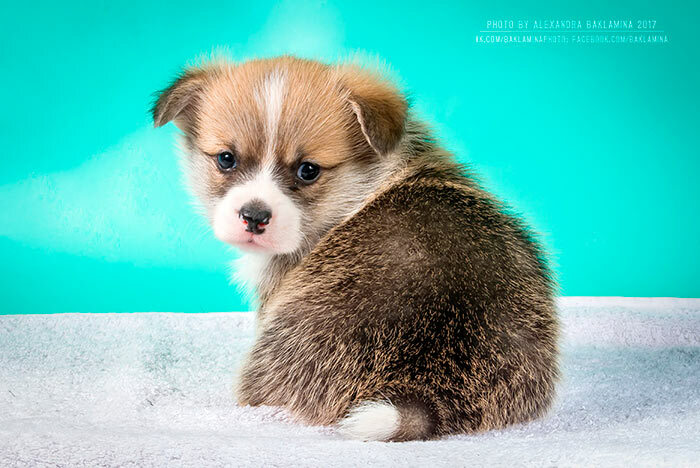 We have welsh corgi pembroke puppies! 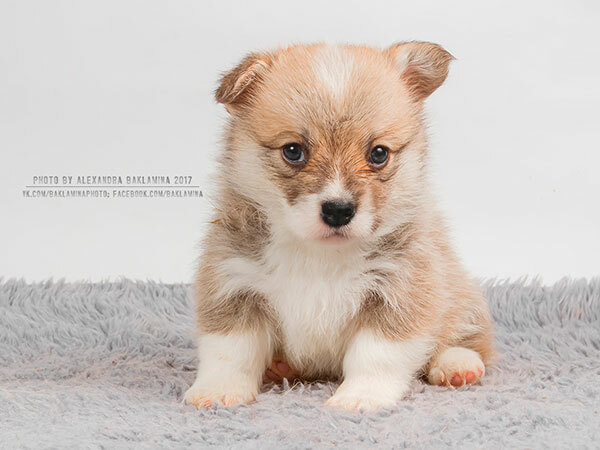 Please, look for all pictures and pedigree of the babies on the page of Z Litter! 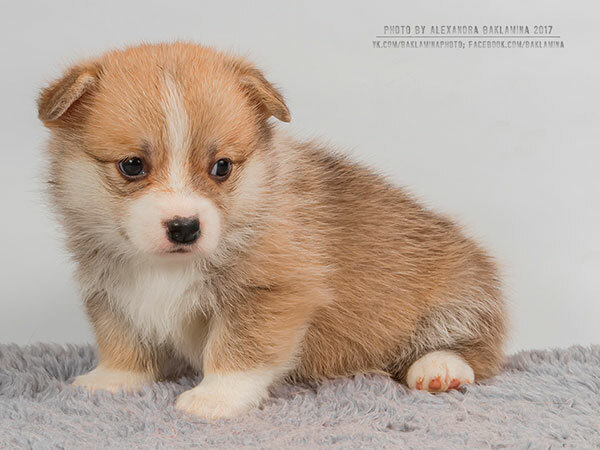 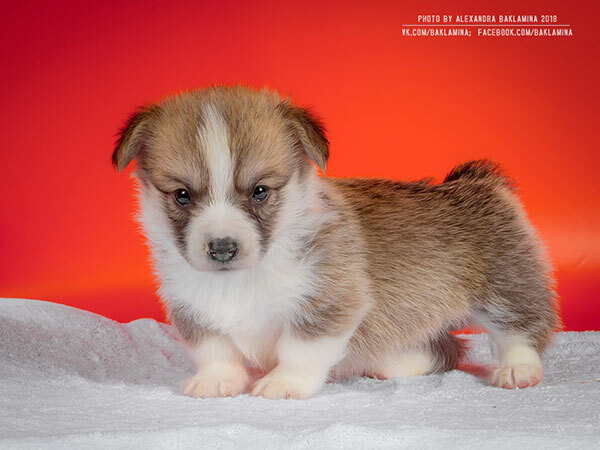 Welsh corgi pembroke puppy Alfawish EASY STEP, red&white female. 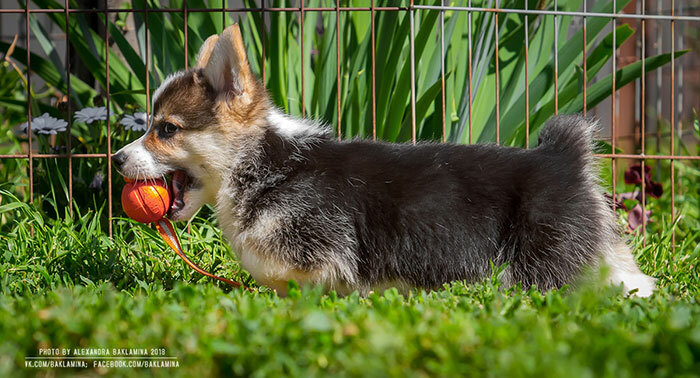 2 red&white and 2 tricolor males, 1 red&white and 2 tricolor female. 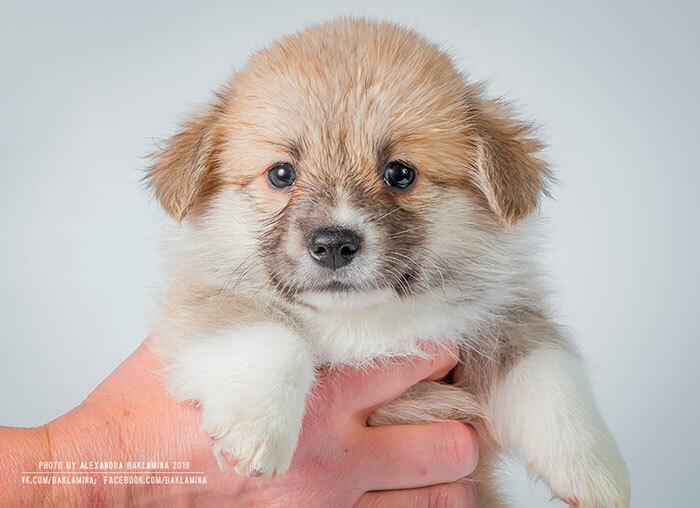 Please, look for all pictures and pedigree of the babies on the page of E Litter! 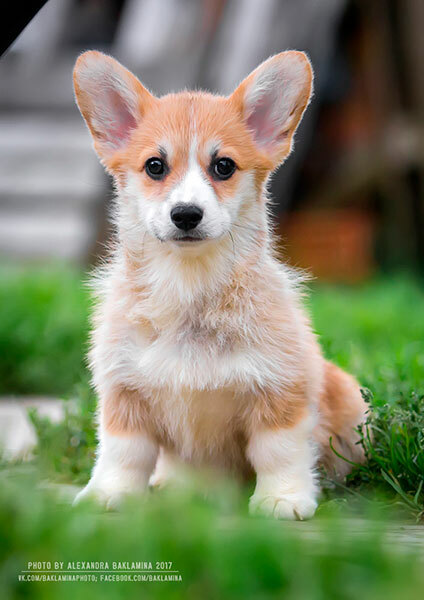 D.o.b. 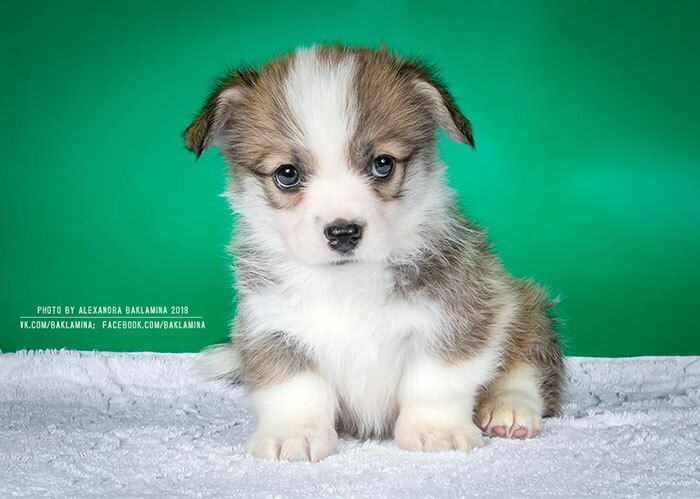 23.06.2018, 1 red&white and 4 tricolor males, 1 tricolor female. 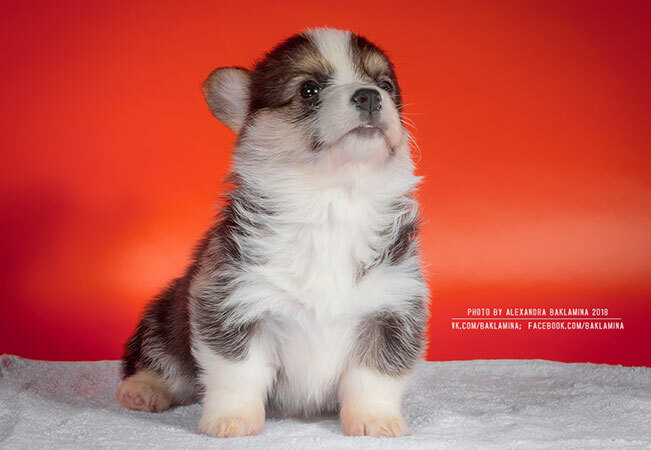 Please, look for all pictures and pedigree of the babies on the page of G Litter! 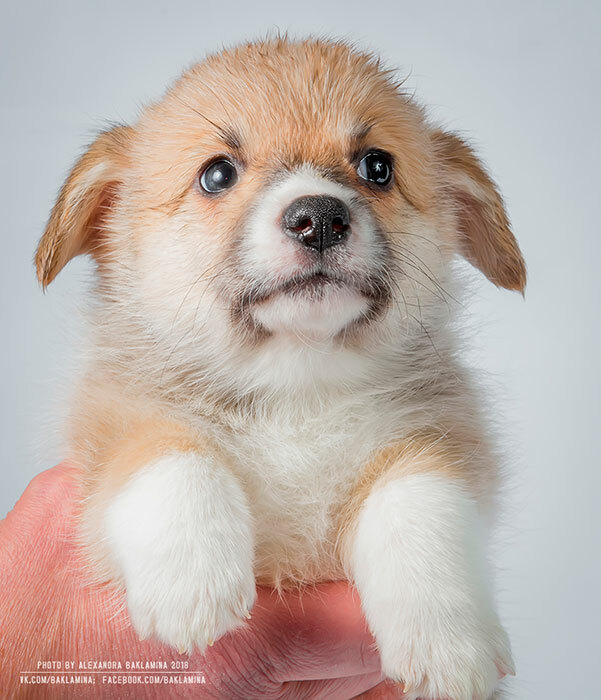 D.o.b. 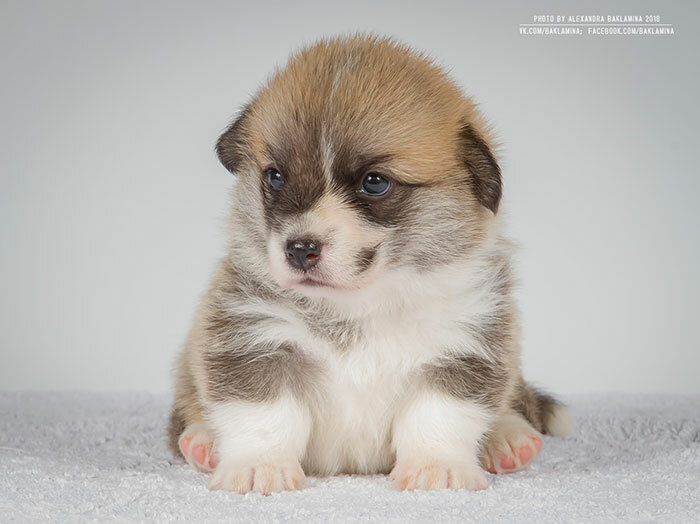 28.06.2018, 1 red&white male and 1 red&white female. 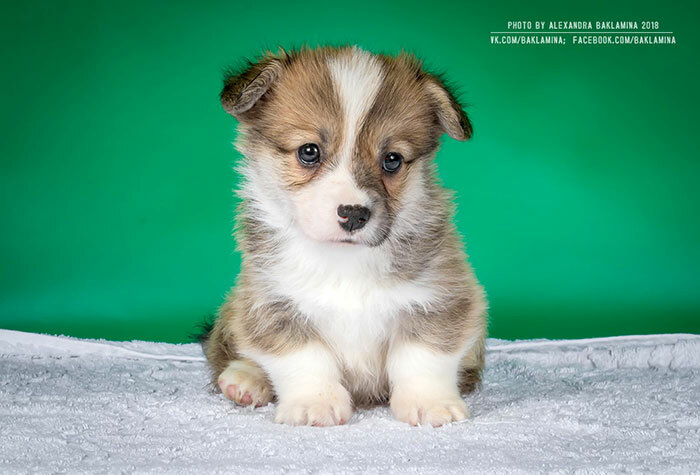 Please, look for all pictures and pedigree of the babies on the page of D Litter! 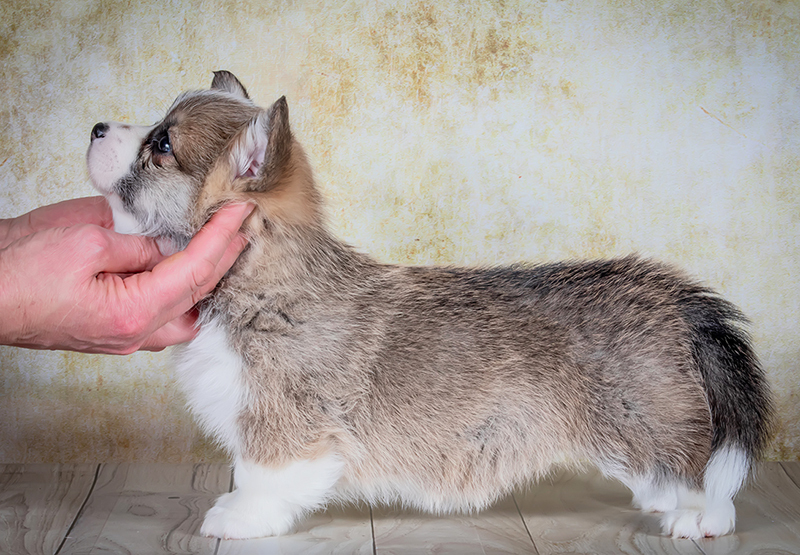 Natural bobtail tricolor welsh corgi pembroke girl Valery is waiting for the best owners! 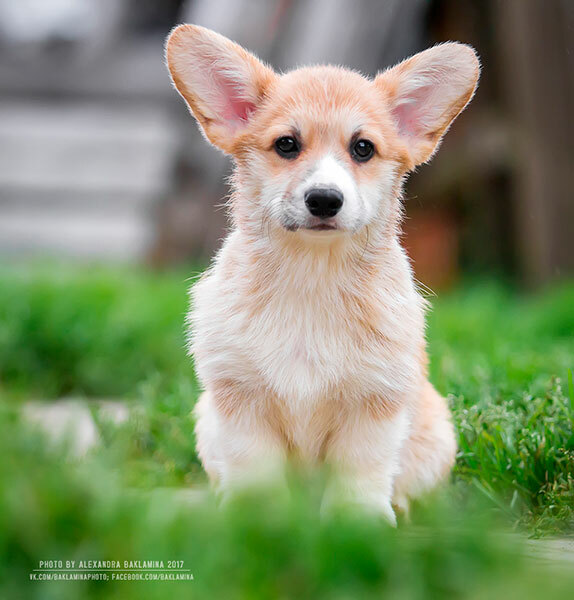 Look for all pictures and pedigree of the puppy on the page of V Litter! 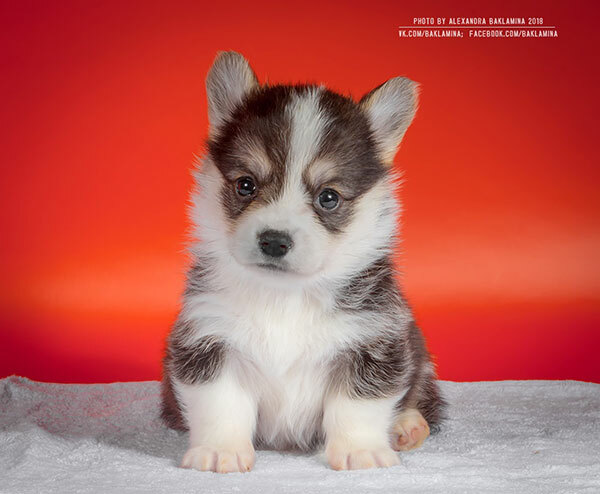 We have 8 red&white and tricolor welsh corgi pembroke puppies! 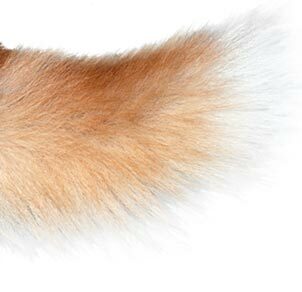 6 of them are natural bobtails! 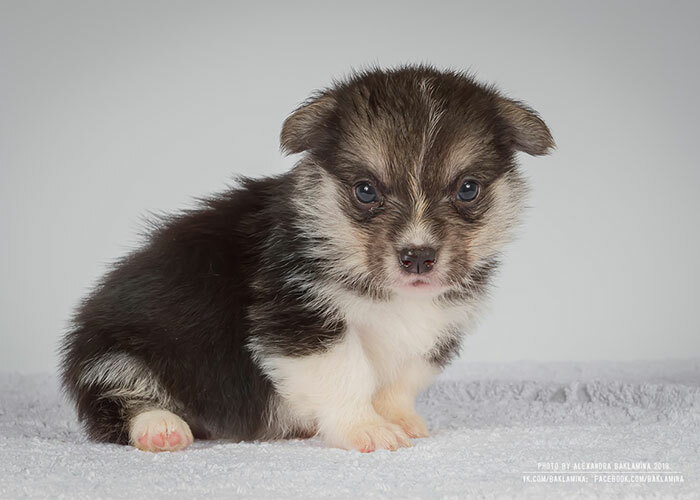 Mother: RUS CH Ginger Elf ANAIS. 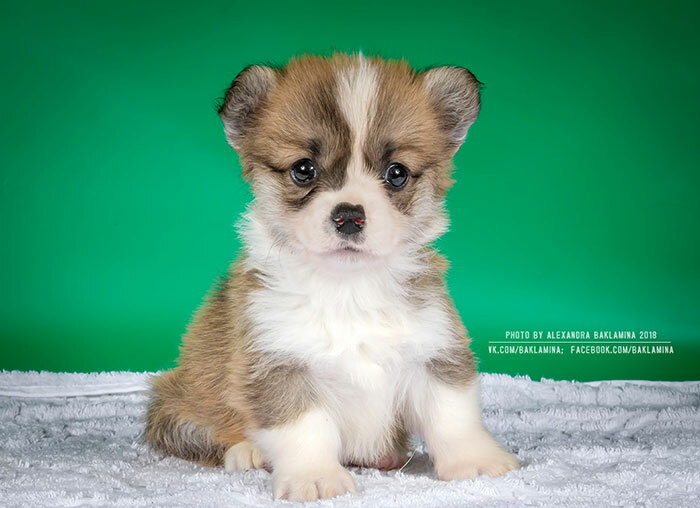 We have new welsh corgi pembroke puppies — 1 boy and 3 girls! 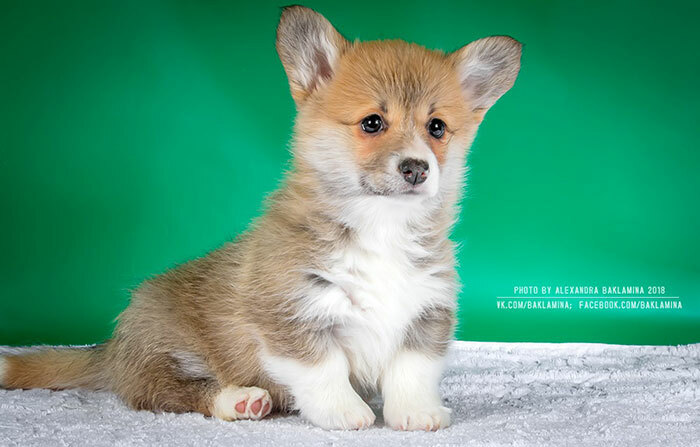 All puppies are red&white with normal tailes! 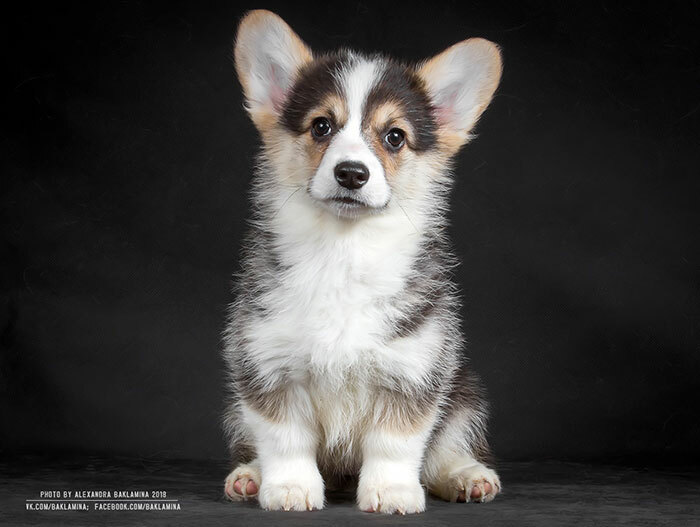 Mother: Craigycor CUPCAKE (imp. 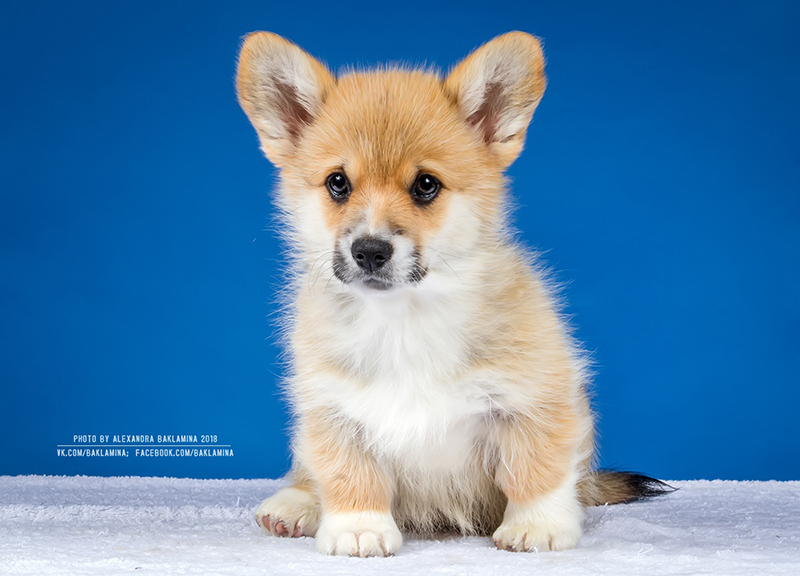 England). 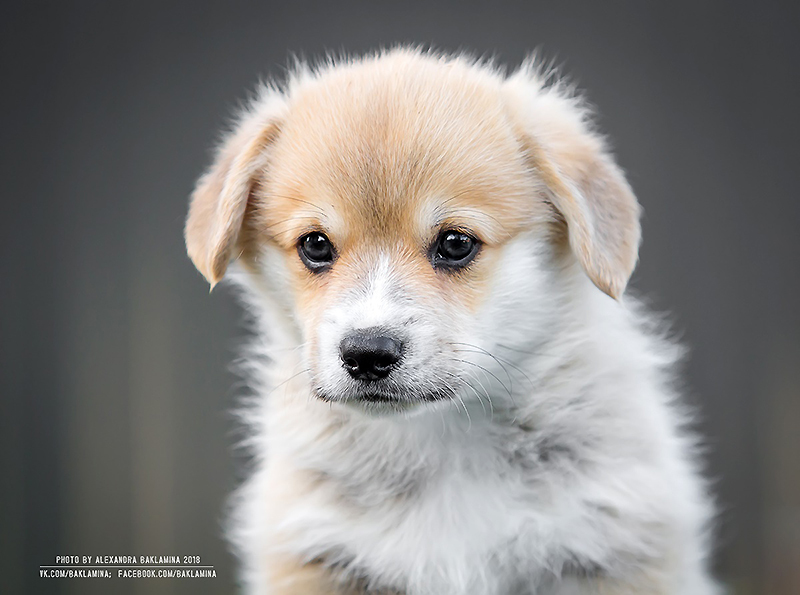 Look for all pictures and pedigree of the puppy on the page of B Litter! 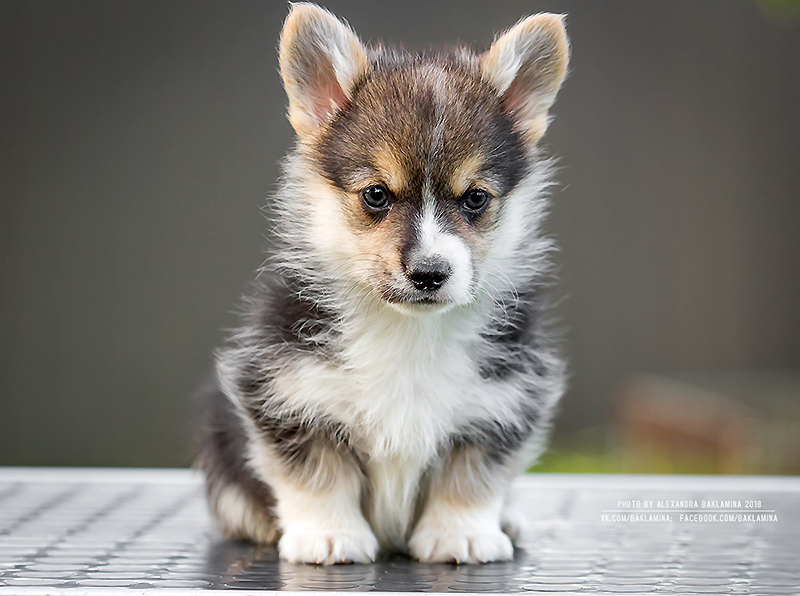 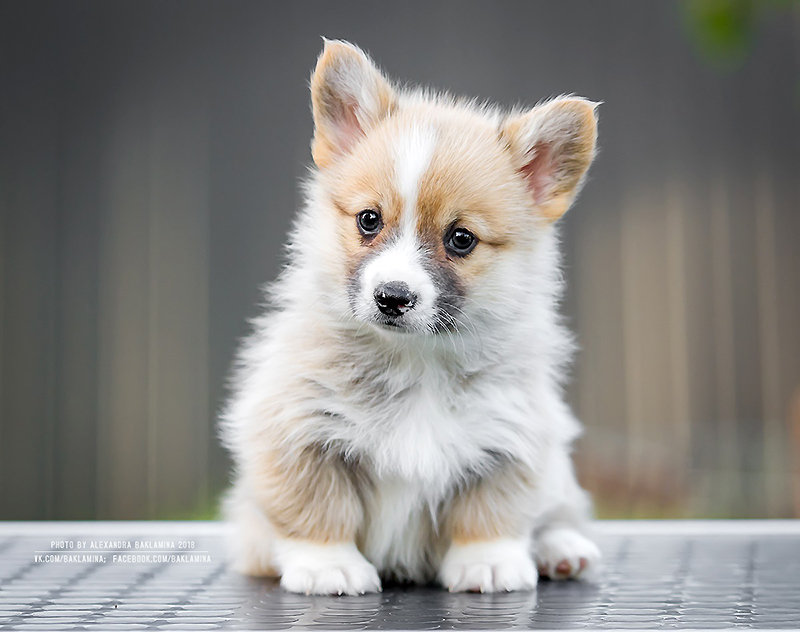 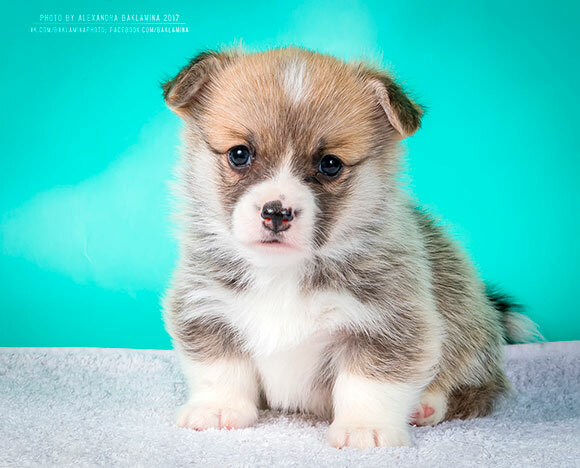 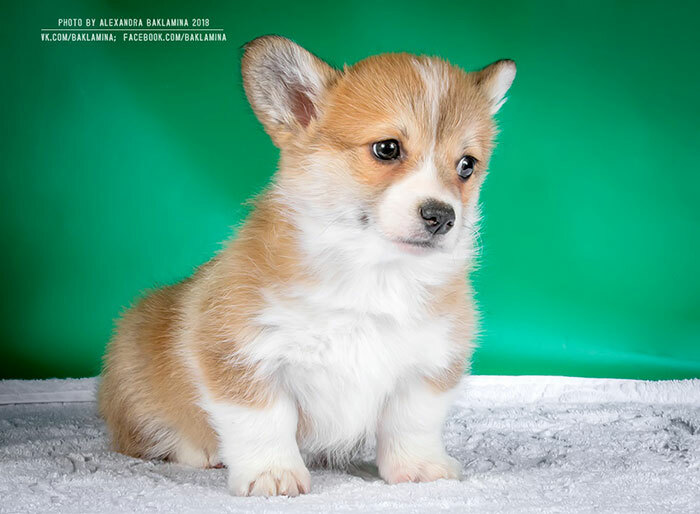 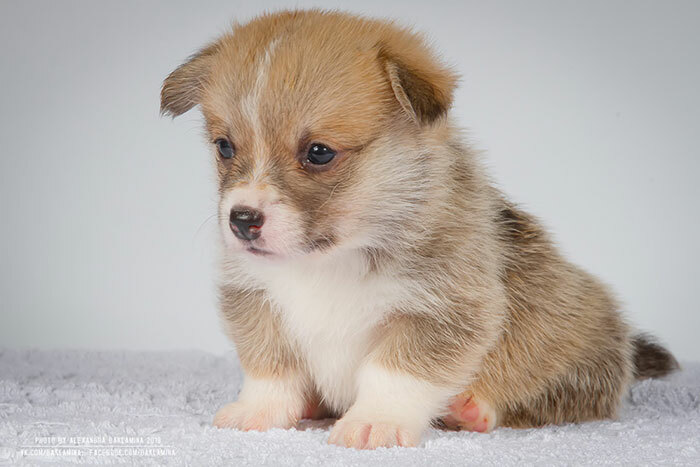 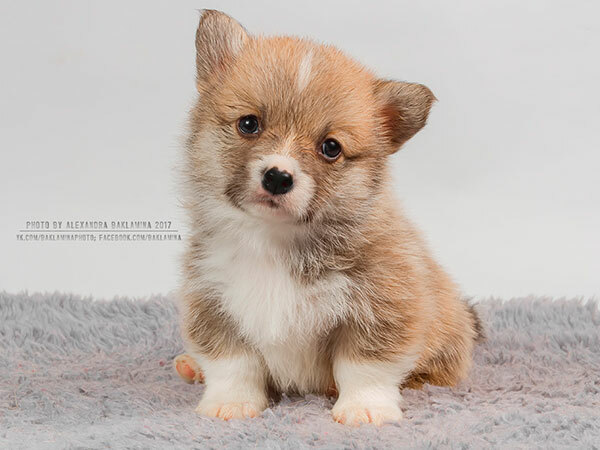 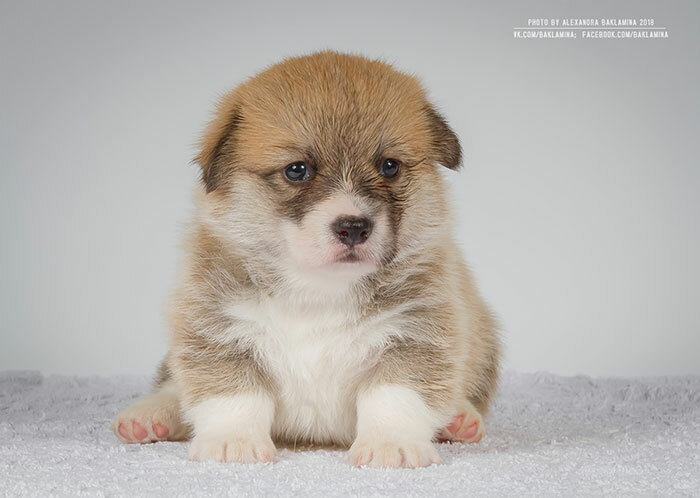 Welsh corgi pembroke puppies A Litter are waiting for the best owners! 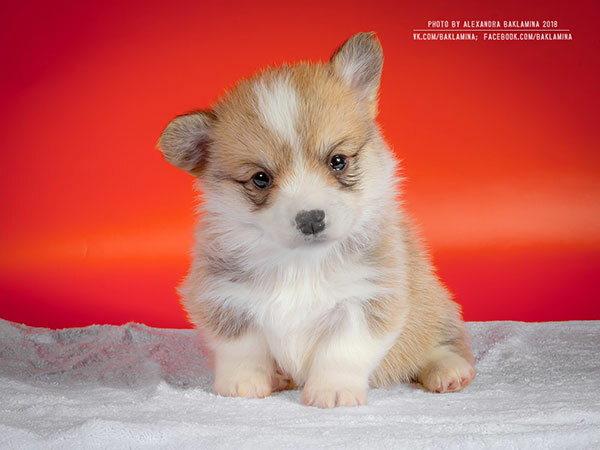 Look for all pictures and pedigree of the babies on the page of A Litter! 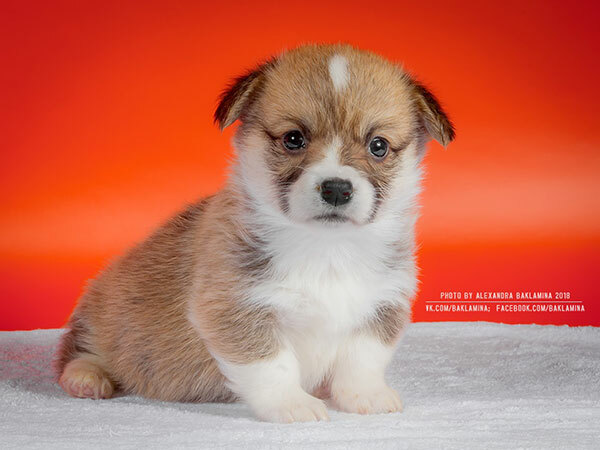 We have new welsh corgi pembroke puppies — 1 boy and 8 girls! 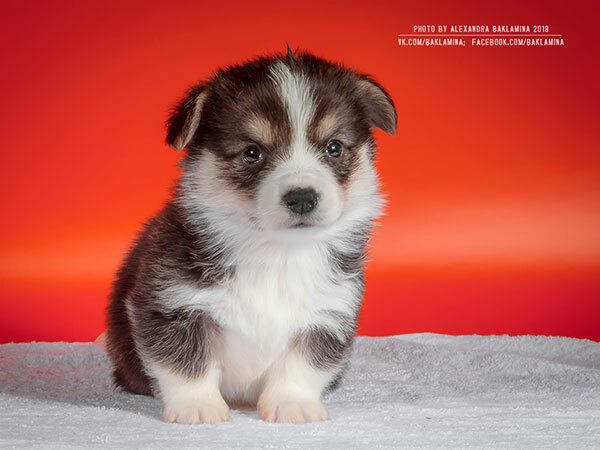 All puppies are red&white with normal tailes! 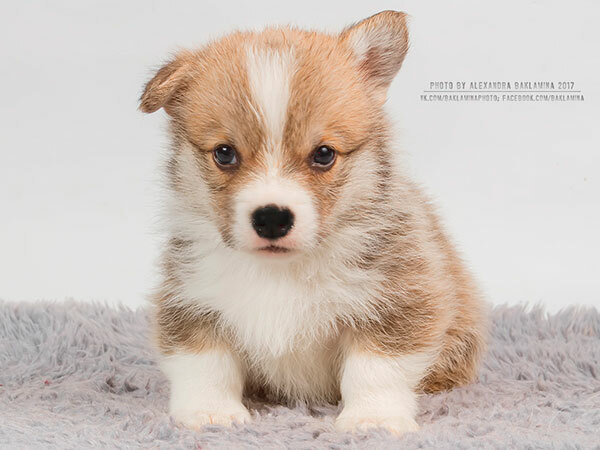 Look for all pictures and pedigree of the puppy on the page of J Litter! 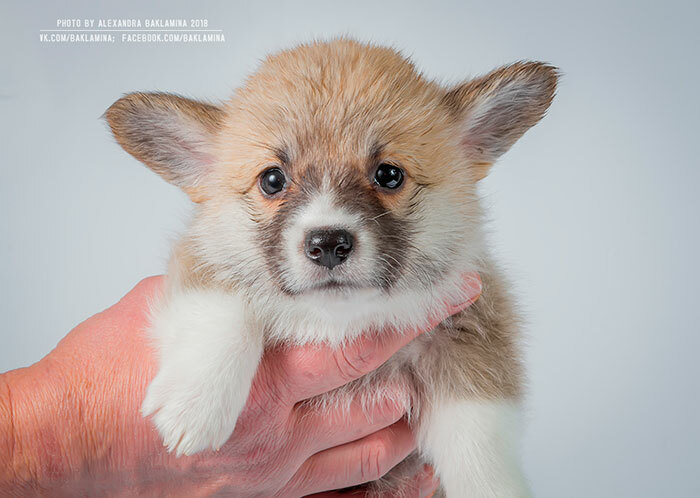 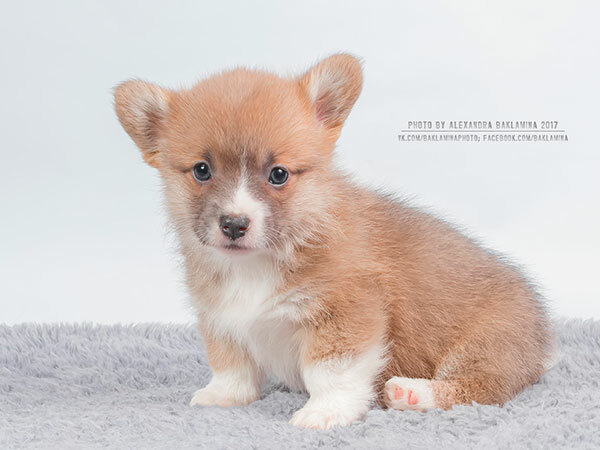 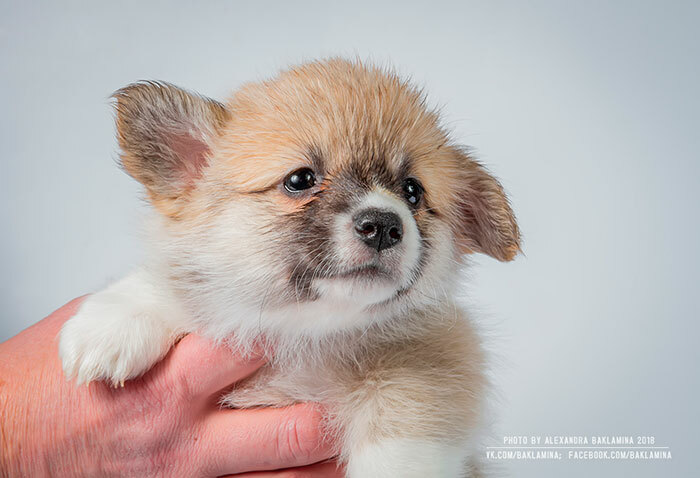 We have the first pictures of our welsh corgi pembroke puppies! 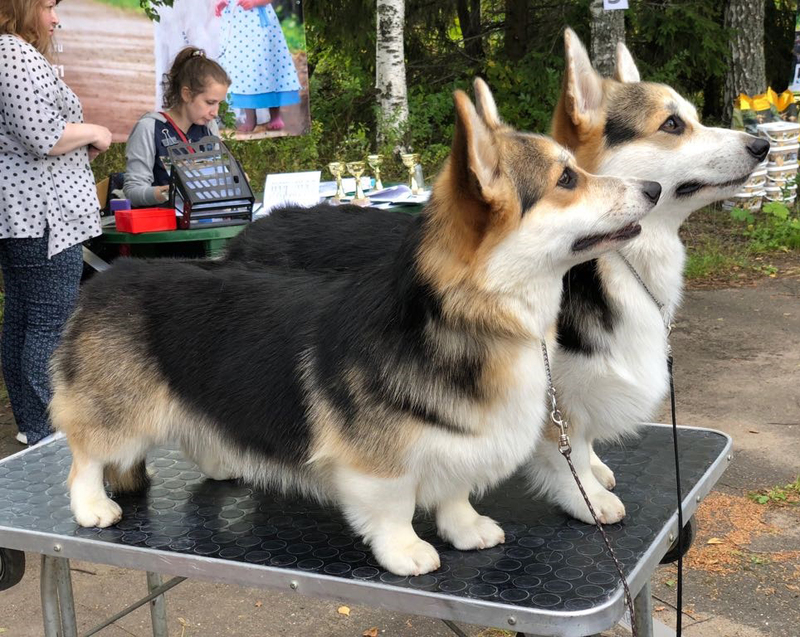 They are looking for the best homes! 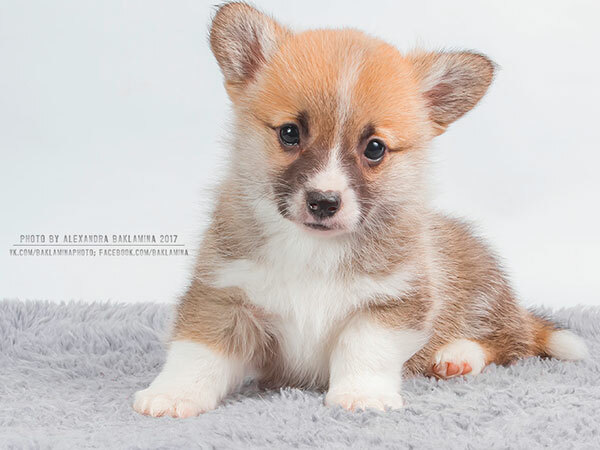 Look for all pictures and pedigree of the babies on the page of SH Litter! 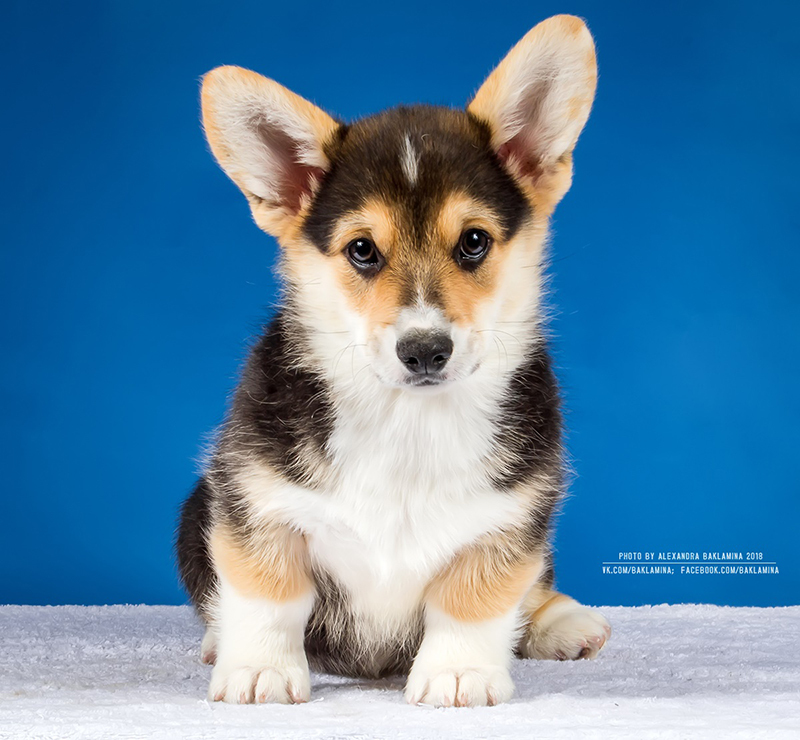 Red&white welsh corgi pembroke boy Alfawish CHURCHILL WINSTON is looking for the best owners! 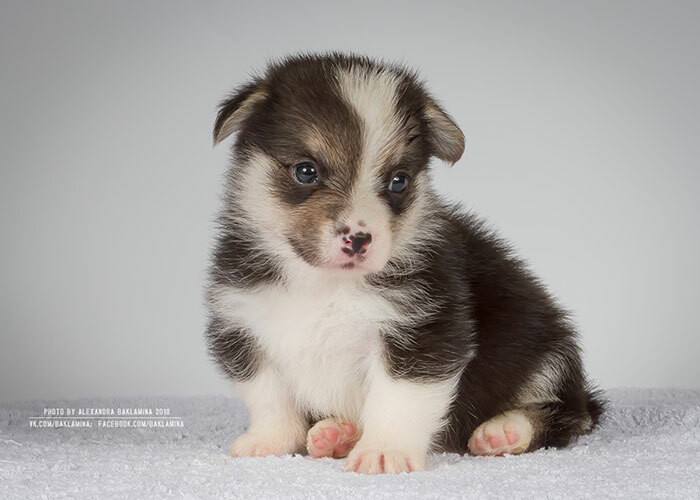 Look for all pictures and pedigree of the puppy on the page of CH Litter! 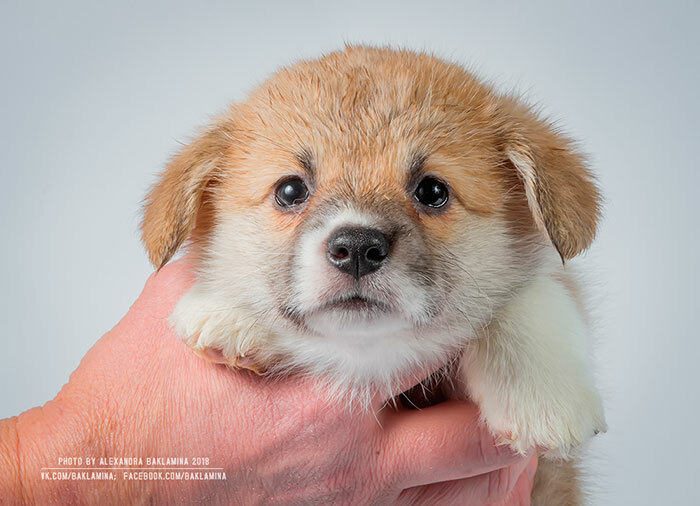 On the 1st of November new puppies were born in the Kennel! 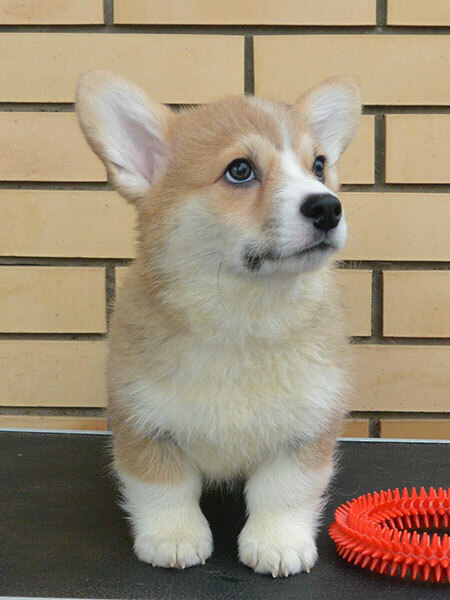 We have 2 tricolor girls, 3 red&white girls and 1 red&white boy. 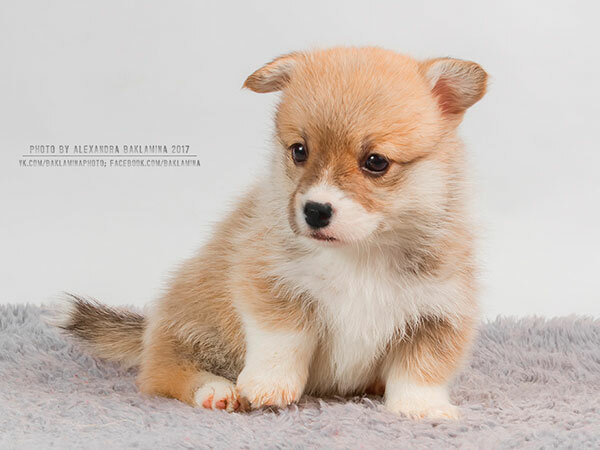 Mother: RUS CH, RKF CH Ginger Elf YASMIN. 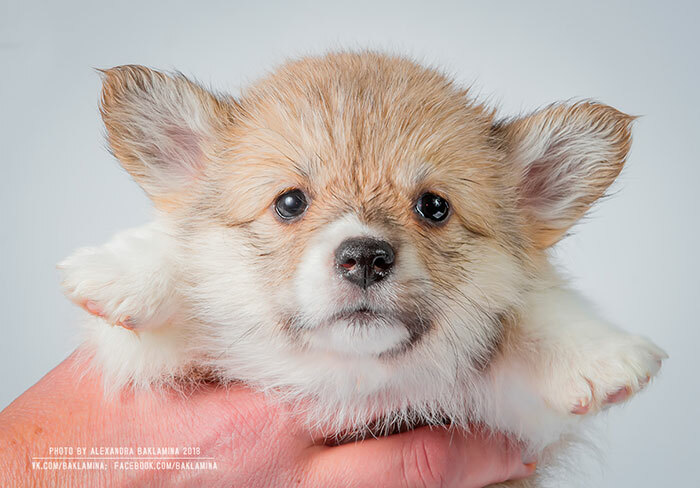 We have new 2 litters! 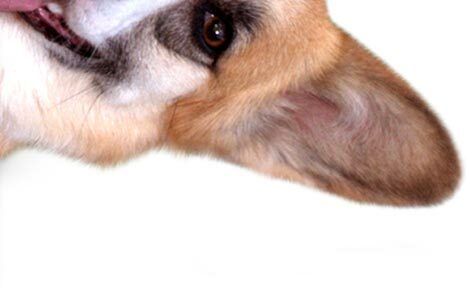 D.o.b. 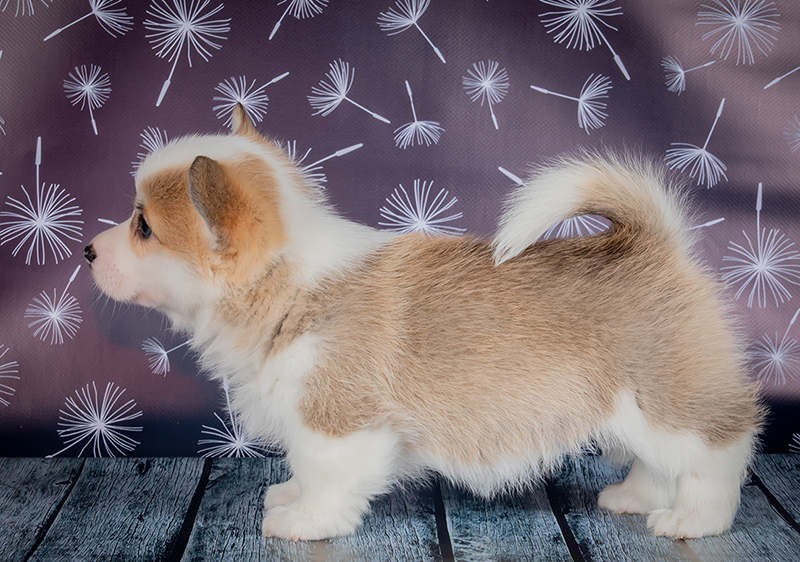 11.08.2017, 2 red&white males and 1 red&white female. 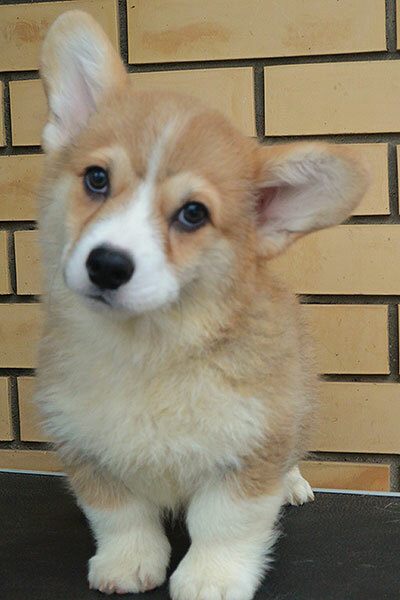 Please, look for all pictures and pedigree of the puppies on the page of H Litter! 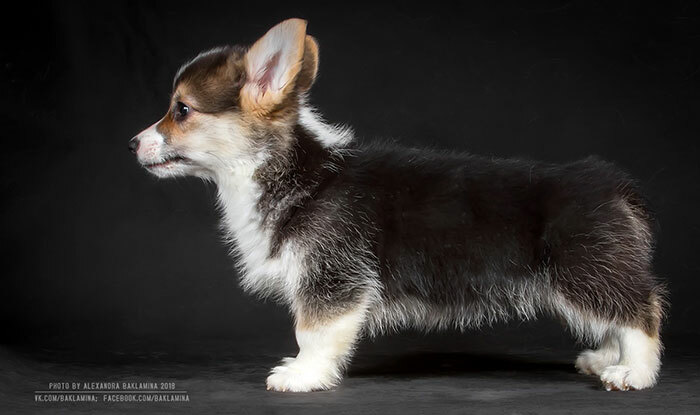 D.o.b. 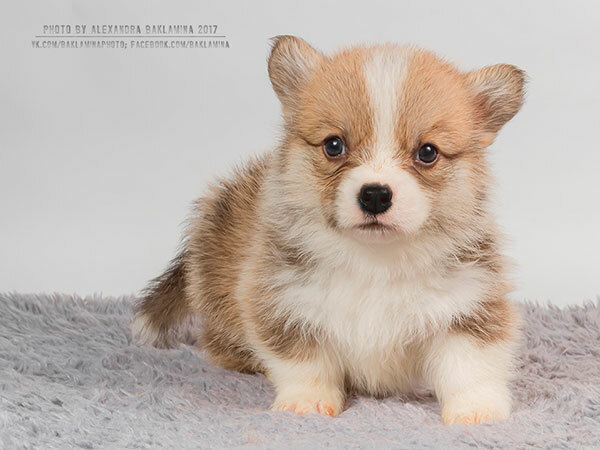 18.08.2017, 2 red&white males and 1 red&white female. 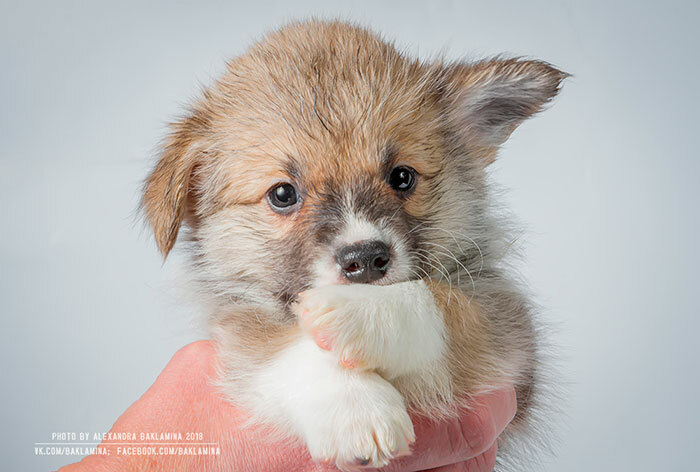 Please, look for all pictures and pedigree of the puppies on the page of CH Litter! 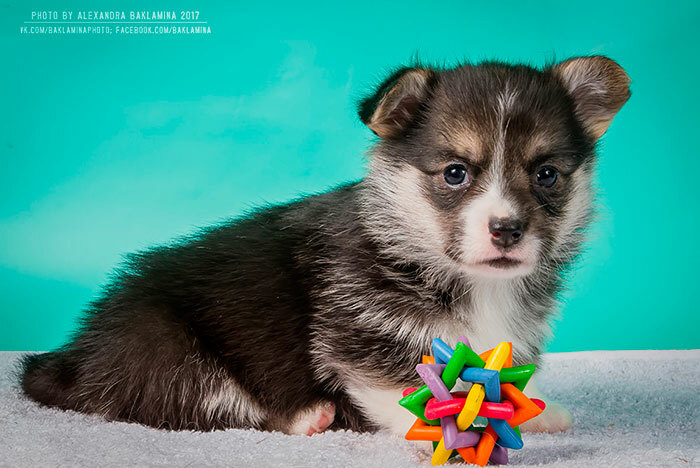 Two boys out of F Litter (born on 16.06.2017) are still waiting for the best homes! 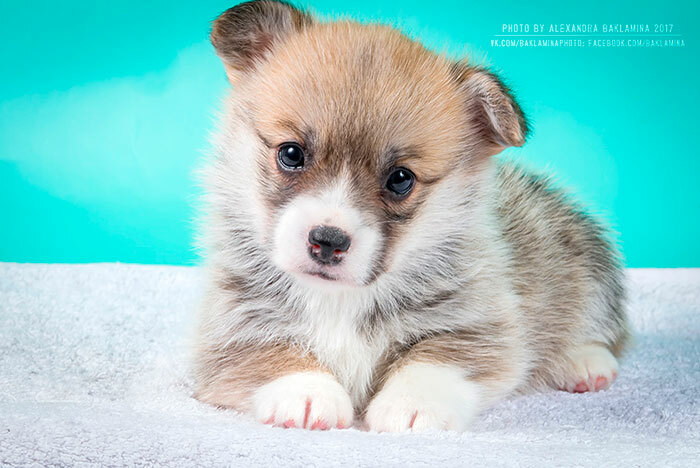 Please, find all pictures and pedigree of the puppies on the page of F Litter! 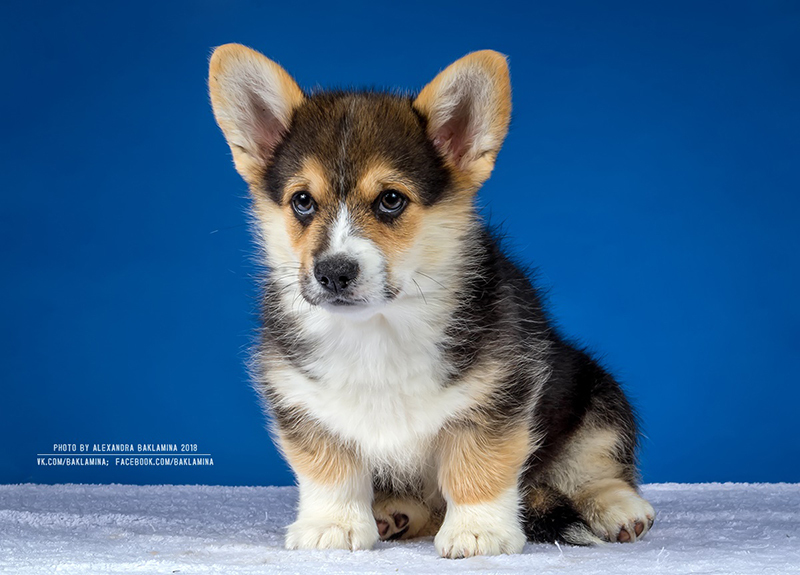 Welsh corgi pembroke puppy boy is for sale! 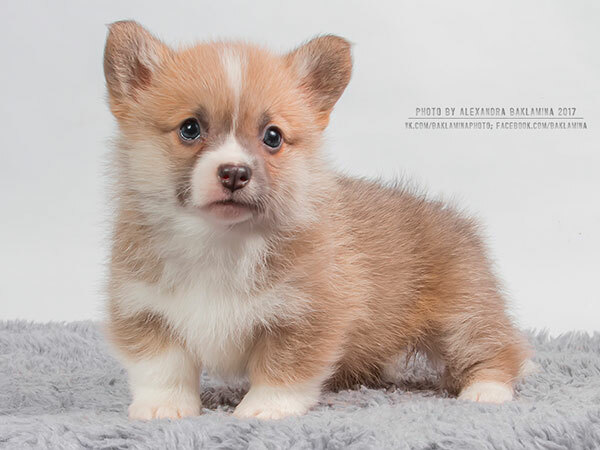 Baby was born on the 12th of April, WW; EUW; Club CH; INT CH Andvol MERCURY x Craigycor CUPCAKE (imp. 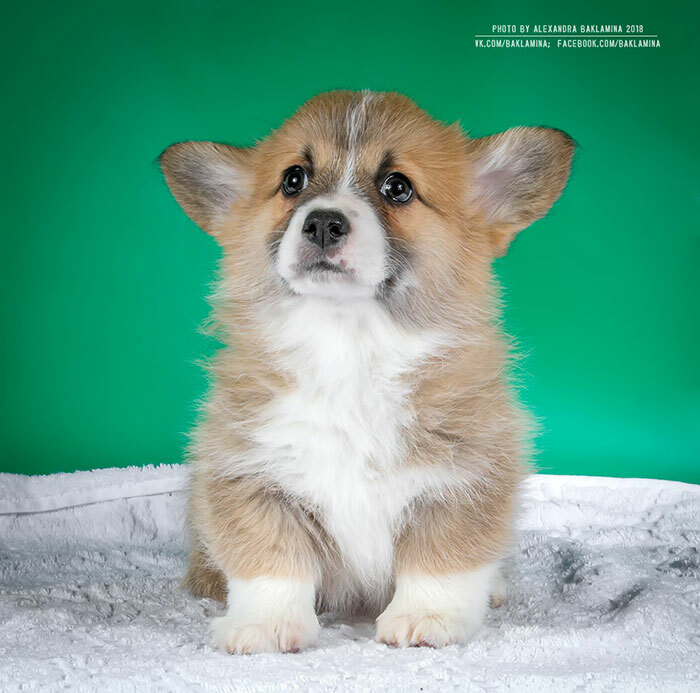 England). 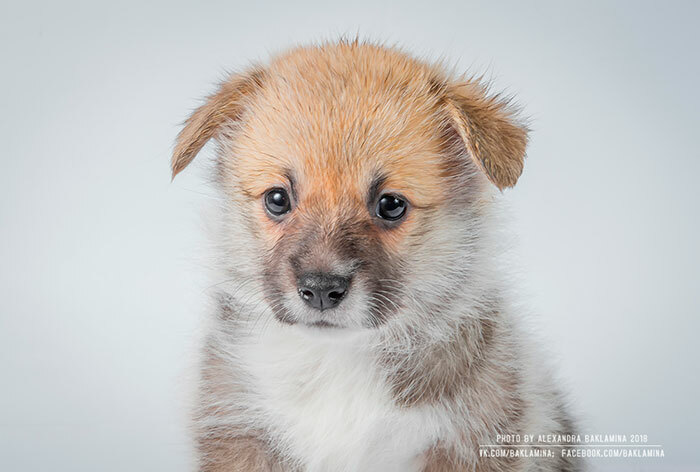 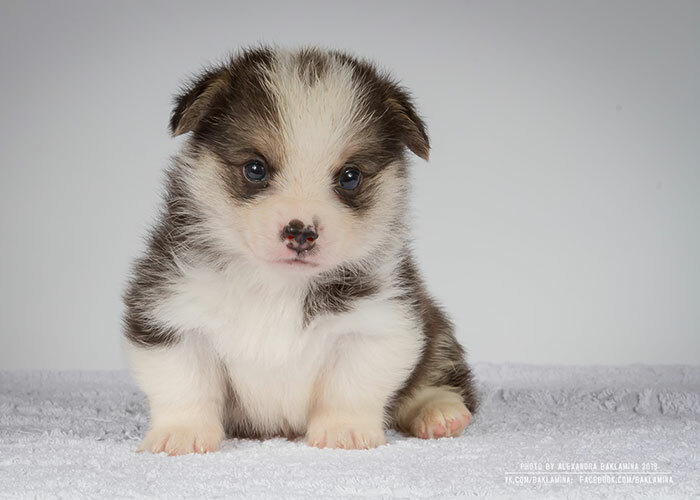 Please, find all pictures and pedigree of the puppy on the page of U Litter! 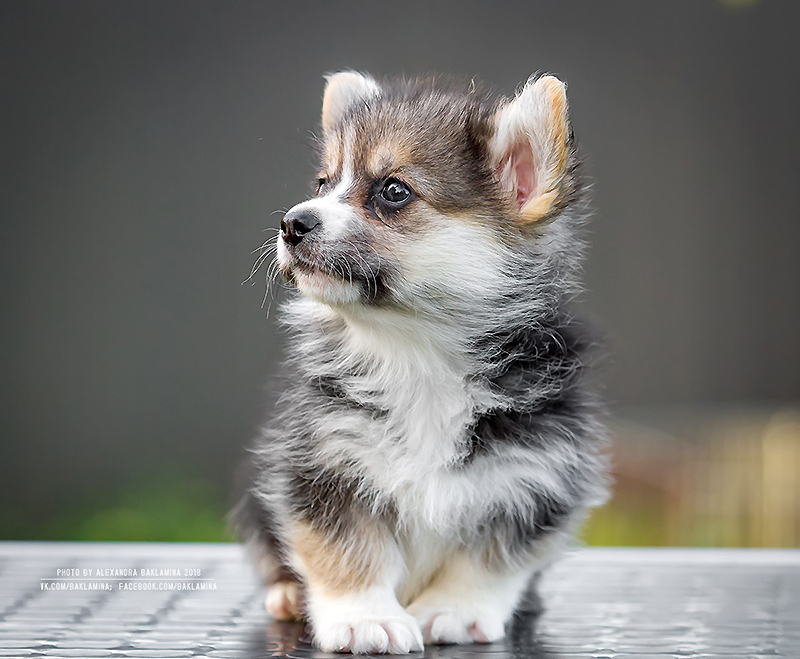 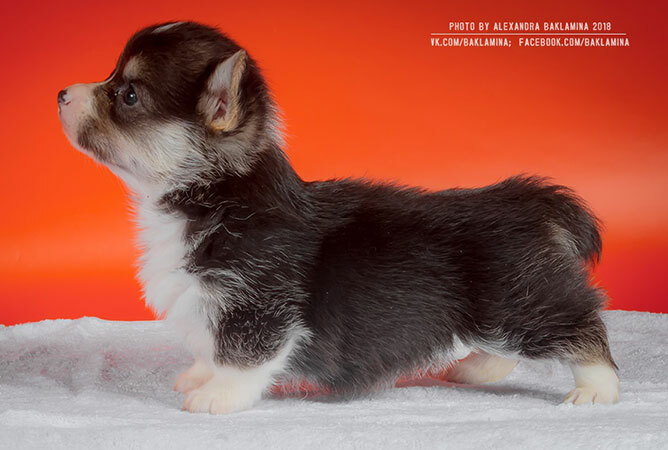 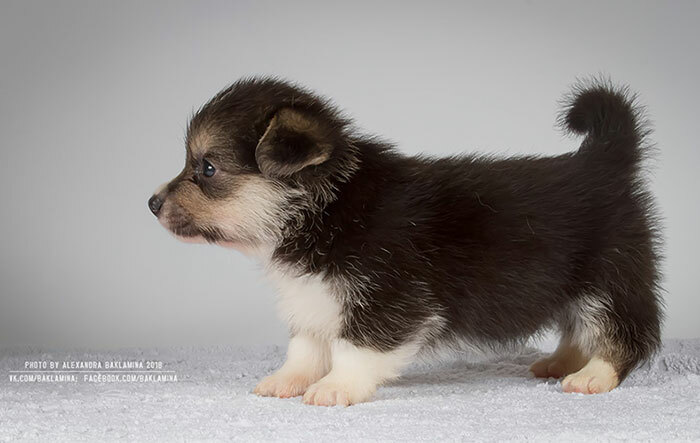 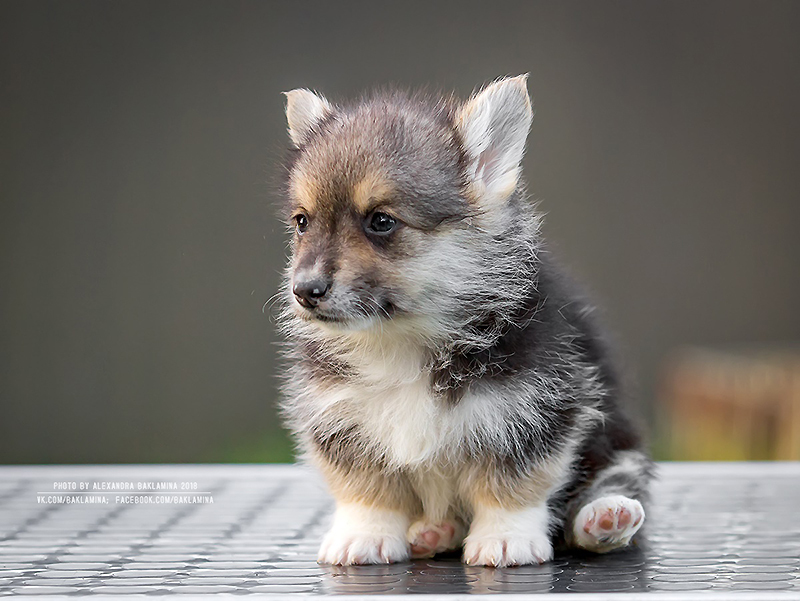 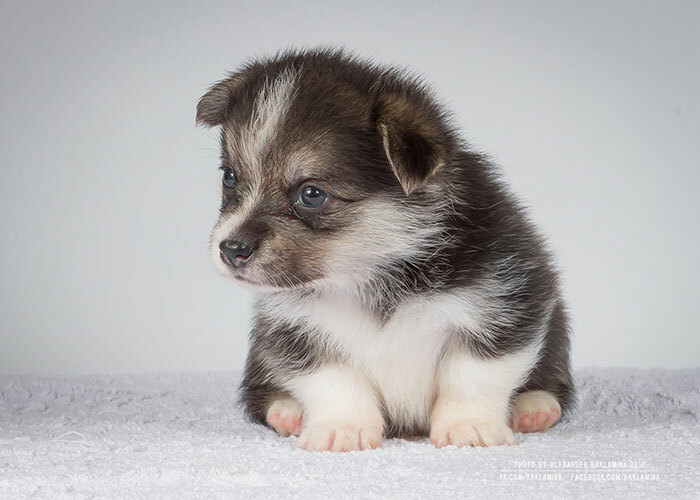 © 2010 Welsh corgi pembroke Kennel ALFAWISH, Moscow, Russia.